Do you know that the miracles of the Bible are still happening today? Have you ever experienced a miracle from God, or do you know someone who has? If your answer is yes, then you know that miracles from God are real and that miracles still happen today; truly, a miracle from God settles the issue. There are many people who are in desperate need of a miracle in their life due to problems, heartaches, and needs. Some individuals have been struggling so long that the thought of receiving a miracle from God has not even occurred to them. Many, if not most, would give anything to receive a miracle from God if they only knew that He is concerned about them and if they understood what they can do to receive His miracles. 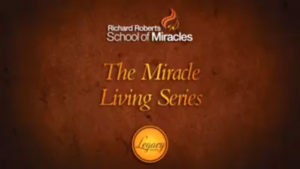 In this course, Lindsay Roberts takes students through a daily guide to experiencing God’s miracles and successful living through the principles of Seed-Faith living. Students will gain a clearer understanding that God is a good God, and that He still desires to provide miracles in our daily affairs. Students will discover key faith-building points that are essential to successful daily living, with a special emphasis on the importance of helping friends, loved ones, coworkers, and others experience God’s miracles in their lives as well.